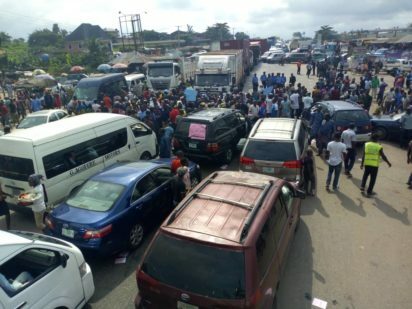 Benin – Ore – Lagos expressway was blocked for over five hours today, stopping the free movement of vehicles and commercial activities, by the irate youths who were protesting the lack of power supply in Ondo south for over ten years. The southern senatorial area of the state consist of six local government which are Odigbo, Irele, Okitipupa, Ilaje, Ese Odo and ile- oluji. The youth had given an ultimatum before the showdown by were ignored by the government. The youths under the umbrella of the United Action Democracy, came out as early as 7 am to close all routes that led to the Benin-Ore-Lagos road and stopped every movement on the expressway. 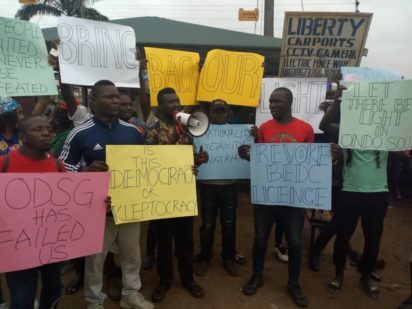 The youths who were armed with various placards with inscriptions, such as “Restore Light Back To Ondo South, “Revoke BEDC License”, “10 Years Darkness Wetin We Do”, “ODSG Has Failed Us”, “This Total Blackout Has Crumble Our Business”, “Agboola Ajayi Is A Wicked Man”, said the government at both state and federal have failed them. They said that the blackout has resulted in a lot of youths taking to crime and blamed that Benin Electricity Distribution Company (BEDC) for “plunging the communities into total darkness. Their spokesperson Kunle Ajayi said that the youths decided to “shut down the busy express road after all dialogue with the government had failed to restore electricity to all the affected areas of the southern communitie. Ajayi said the officials of the Benin Electricity Distribution Company, (BEDC) deliberately cut off the district from the National Grid. According to him “the power outage has further paralyzed major business activities in the southern areas of the state mostly for those who need electricity to power their trades. “The problem of the non-payment of electricity bill which had been the excuse of the electricity company should not be vested on consumers who had been consistent with the payment of their electricity bills. “For over ten years, our people have been living in a perpetual darkness and this government has kept mute over our plight despite many plea. “In fact, the current government in Ondo State under Governor Rotimi Akeredolu used this epileptic power supply for its campaign and nothing has since been done till today. “But it is unfortunate, and rather for them to address the issue, same government was paying people to attack us since we have refused to back down in our agitation for the restoration of light to the areas. “So, Our demand is that we want the licences of the Benin Electricity Distribution Company, (BEDC) to be immediately revoked by the Federal Government. “We want the government under Governor Rotimi Akeredolu and his Deputy Agboola Ajayi to immediately stepped down because they have failed us completely. “We are also asking the government to immediately restore electricity to these affected local government areas in the senatorial district of the state because this suffering is now enough for our people.